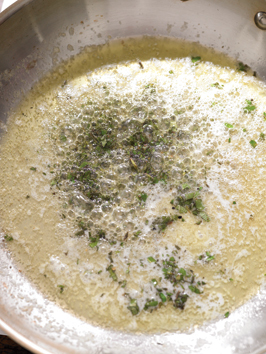 Melt butter in a heavy-bottomed saucepan over medium heat, stirring occasionally until solids turn light brown. Pour off half of butterfat and reserve for another use. (Be careful to save brown bits in the pan.) Add rosemary, thyme, sage and oregano to the brown butter and cook 30 seconds. Whisk in the lemon juice until balanced flavor is achieved. Season to taste with salt and pepper. Tip: Toss with warm asparagus and grilled scallions, brush vinaigrette over halved zucchini or tomatoes and broil, or dress a warm salad of grilled pork, olives and spinach.